Q² Booster is probably the most exciting new product we launched for every insane-hydrophoby lover. Why is it so special? Because it's a special, ultra-innovative, fluorine based top-coat for every SiO2 coating, including those outside of the Gyeon range, that provides not only more durability of the base coat, but also very, extremally high hydrophoby/beading. If you like Q2 Prime, Q2Mohs or any other quality glass coating (also outside the Gyeon range), you can easily prolong its hydrophobicity by 6-12 months! Q² Booster is the most versatile top-coat designed and formulated for quartz/ceramic coatings. It enhances water beading in a spectacular way, preventing fresh coatings from developing stains or waterspots whilst increasing overall durability. Ideally applied straight after your chosen quartz coating, (or at least within the first 4 weeks or in other words, before any contamination settles on the paint) this product is very easy to use and provides amazing results. 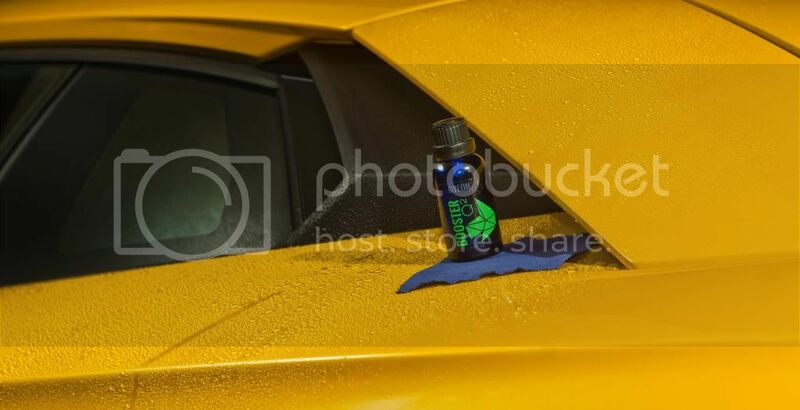 Q² Booster is the easiest way to get the most out of your choice of coating, whether it is Q² Prime, Q² Mohs or even a coating outside the GYEON range, you can increase the durability and hydrophobicity in a massive way. Q² Booster is not a stand-alone product, it only works as a top-coat for previously applied real quartz or ceramic coatings. If you love extreme beading, Q² Booster is the finest product on the market to achieve this. 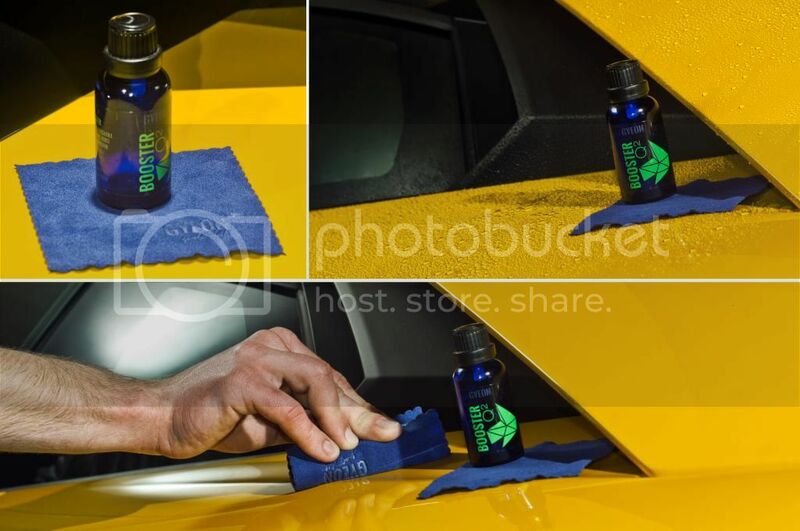 It generates extreme hydrophobicity when paired with GYEON quartz coatings, reaching a contact angle of up to 120". We're not afraid to say, that Q² Booster is the longest-lasting beading top-coat in the world. Used on a quality quartz coating like Q² Prime or Q² Mohs, it will prolong total beading by up to a further 12 months. Look forward to this, excellent. We have just received a small quantity of Gyeon Q2 Booster by Air-Freight today! I don't imagine stock will last long so you'll need to be quick - but don't worry we have another much larger shipment on route to us via Sea-Freight. Interesting looking product however instructions seem to be adamant that application must take place within 2000km of original base coating? Is this perhaps a bit limiting? I suppose there is a danger that contaminants might build-up on the base coat and poor prep before using Booster might limit its performance and subsequent benefits? If i coat first with prime or mohs, how long do i have to wait intill i top coat with booster? the instructions to the book, has anyone else tried it and if they have how did they find the application. It's a mind problem. You don't see it but you are applying product. You can feel it in the slickness. Use the same amount as you would use Prime or Mohs. The "tail" you see is evaporating but after that you are still spreading product. There was no other way to get it more visible without losing the awesome proporties of Booster. When you touch the cloth you can feel is moist and not dry (evaporated). Like I said, it's more of a mind problem than a product problem. Yep, that's probably the only drawback Booster has. You have to use a lot of imagination and visualize where you've already applied the product. Don't worry - it will work properly despite the fact it was hardly visible during work.